The new Babila Hostel & Bistrot Milano was inaugurated on the 15th of September 2017. The elegant and sophisticated building is located in the heart of the Milan fashion quarter, just a short walk from Piazza San Babila. 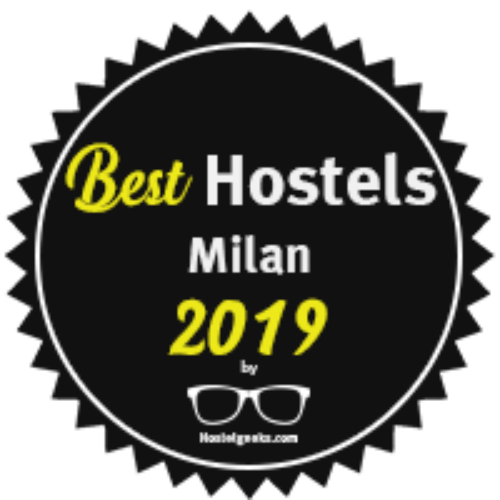 Babila Hostel is a result of a deep restructuring of the west wing of the Victory Column Institute, founded in 1896 by the then Cardinal of Milan, Andrea Carlo Ferrari, who has decided to open a Catholic school in the city. It fits in the tradition of the most modern European Hostel: smart solution for backpackers and dynamic travellers, measured on the needs of both young travellers and families (solutions with 4 beds) or traditional travellers (with private rooms). Beside the accomodation, the Babila Hostel welcomes everybody to concerts, programs and cultural happenings in the Bistrot area and offers a delicious variety of food wines and cocktails! Check out our monthly program and join us! FROM LINATE AIRPORT: you can get the urban line 73 that takes you near the hostel. You just have to get off from the bus at Corso di Porta Vittoria and walk for 4 minutes. FROM MILAN CENTRAL STATION: you can get the underground line M3 (yellow line) to Duomo and then change line M1(red line) until San Babila square. it takes only 6 minutes walk to our hostel. FROM MALPENSA AIRPORT: the fastest way to arrive in the center of Milan is with the train “ Malpensa Express”. you can get off at Cadorna Station and from there take the underground line m1 (red line) to San Babila. There are also buses that bring you to milan central station and from there take the underground. FROM BERGAMO AIRPORT: there are bus companies ("Terravision" or "Orio Shuttle") that take you to Milan Central Station. From there, take the M3 underground, yellow line, to the "Duomo" stop, where you will have to change line, taking the red one, M1, for a single stop, getting off at "San Babila". From there, just enter the Hostel name on Google Maps and walk 5-6 minutes. - parking in front of the hostel in the blue lines of Milan Municipality, paying the fixed rates (you can find all the info&prices on the official website of Comune di Milano). There's an automatic machine where you can buy the tickets just in front of the hostel. - parking in a private parking that is just 4 minutes walking from here. Its name is "Mascagni", and is located in Via Mascagni. It takes 24 euros for 24 hours of parking. The Bar del Babila Hostel is open to everyone starting in the morning with coffee service and italian breakfast, while when night falls and the Hostel starts to animate, it turns into the ideal place where you can enjoy a draught beer, an excellent Italian wine or a delicious cocktail, including the brand-new "Babila Spritz". Come to visit us and find out by yourself! Download our new Drink list! A protagonist of the spring-summer season is also the Aperi-sunset on the terrace with barbecue, whose sandwiches and mixed grills have become the favorite dinner of "backpackers" and locals searching for a new and exciting food experience. "I know a few 3-4* hotels in Europe who could learn how to manage their business from this hostel! Never thought I will praise the customer-service level of a hostel, but practically this is the exact reason this place stands out for. Great attention to details in decorations and services, essentially, the entire staff is smiling and is willing to help"
"Good location. Very clean white bedsheets and towels. Generally clean every where. Amazing staff. Comes with free breakfast. It felt like I was in a hotel . Amazing guests. Made new friends!" "The location is superb! Walking distance to cathedral. Staff are nice and room is clean. They provide towels and lockers. highly recommended to stay this hostel"
"Hotel like, boutique Hostel, with great team and amenities, roof terrace, bar with aperitivo, Restaurant w daily menu, Gym and much more. Free beer on arrival. Map and itineraty for every guest"
"We had an excellent stay. The staff was very nice, always willing to make you feel comfortable. The place is just amazing and very well located"
03. How can I reach the Malpensa airport? And how long does it take? To reach Malpensa airport takes approximately 45 minutes to 1 hour. The bus stops in both terminal 1 (main terminal) and terminal 2. The cost is about 10€ for one way and 16€ for a return. It is also possible to catch the train from Cadorna to Malpensa. YOU CAN GET THE URBAN LINE 73 THAT TAKES YOU NEAR THE HOSTEL. YOU JUST HAVE TO GET OFF FROM THE BUS AT C.SO P.TA VITTORIA AND WALK FOR 4 MINUTES. You can reach the airport of Bergamo Orio al Serio with the shuttle bus from Central Station. The time is about 50 minutes depending on traffic. You can check-in from 2 p.m (14:00) and, from there on, when you want (our reception is h24). If you arrive before your room is ready, you are advised to store your luggage in the special locker located on the floor – 1 (available while spaces last) or to use the space at the reception side. Check-out is until 11:30 a.m; afterwards you can leave your luggage in the spaces above. No, late check-out (after 11.30 am.m.) is not allowed, except for extraordinary cases, but the reception must be notified in due time. As a rule, however, it can not be granted more than half an hour late. In case of check-out more than half an hour late, and without having notified the reception, a fee of 10 € will be charged. Early check-in (before 2 p.m.) is allowed only with prior authorization from the reception, after having checked the availability of the bed / room with the cleaning service. Late check-in, if you intend late in the evening or even after midnight, is absolutely possible as our reception is open 24 hours a day. Yes. We offer free internet Wi-Fi in every room and common area! Of course, Babila Hostel is a pet-friendly accommodation.